With the common reminder that humans spend 90% of our time indoors, coupled with a growing body of upwards of 400 research studies that indicate there are hazardous chemicals in our building products that building occupants are exposed to, the focus on healthy, sustainable materials across the design and construction industry is at an all-time high. This has created a lot of noise in the materials space, including the launch of 10 international building industry chemical initiatives in the past six years alone. While each initiative is helping the industry make strides to combat dangerous toxins in the built environment, it’s difficult for design professionals and building owners to know how to best utilize them, making it a challenge to set healthy materials goals. 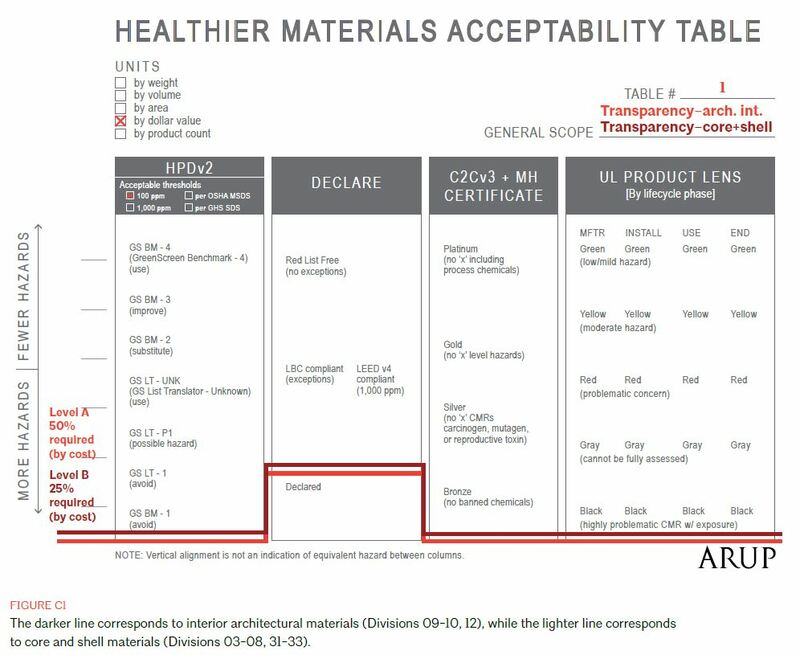 In response, the AIA and Arup launched the Prescription for Healthier Building Materials: A Design and Implementation Protocol in Spring 2018, a comprehensive overview of the background, challenges, and solutions facing the building community in the healthy materials realm. Born out of a group of organizations with a vision of buildings as a public health service, protocol authors Frances Yang and Sara Tepfer at Arup conducted rounds of extensive interviews with the industry’s leading hyper-focused materials experts to outline best practices for approaching healthier building materials. The protocol addresses industry confusion around materials and simplifies it in a way that allows the reader to set, prioritize, and develop an implementation plan for meeting healthy materials goals while strategically leveraging the most notable industry building and product certifications. It’s a step by step guidance tool, chock full of clarifying graphics and actionable resources for any design team, highlighting that regardless of size or scope, any project can provide a healthier environment for occupants through meaningful materials goals. stok was interviewed for the protocol to share our experience in developing and implementing healthy and sustainable materials programs. Here, our materials experts outline key takeaways and tools from the 116-page document. Certification systems like LEED, WELL, and the Living Building Challenge have laid the groundwork for outlining which industry initiatives around healthy and sustainable materials designers should use, but they don’t advise project teams on how to use them strategically. The protocol highlights how to utilize what the industry’s already given us in a way that makes sense for your project and your client. By outlining how to be strategic in setting goals, the protocol helps smaller teams and budgets make the most impactful decisions for the materials on their projects, showing how healthy and sustainable materials selection doesn’t have to be an all or nothing commitment to make an impact. stok has had much greater opportunity for impact when owners are driving healthy materials goals. We recently released a report on the financial case for high performance buildings, which outlines the business case for developing healthy, human-centric indoor environments. Connecting healthy materials goals to financial returns, coupled with education around the upstream and downstream impacts of healthy materials selection, is a good way to develop owner buy-in. 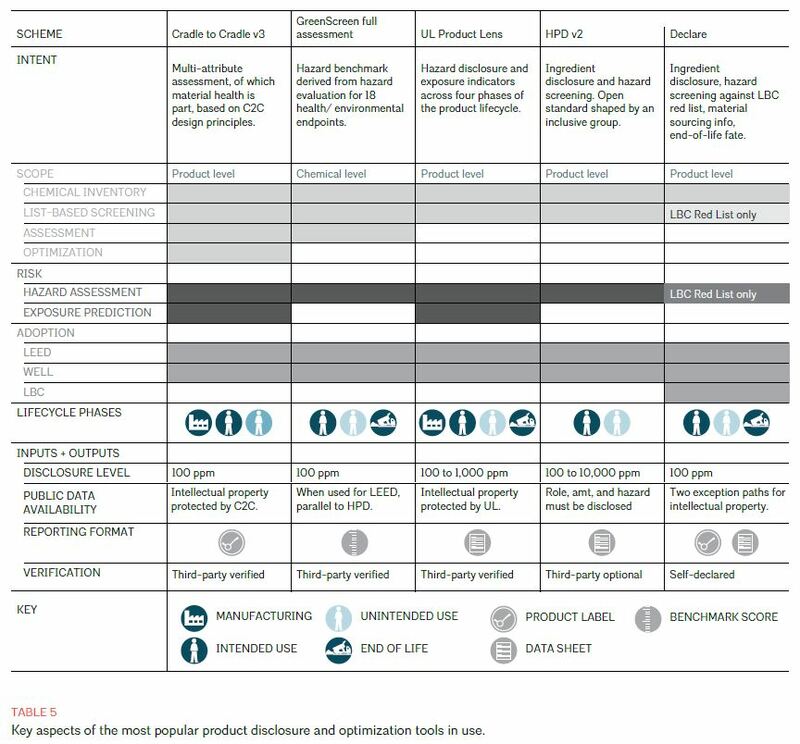 A table on p.98 clearly outlines key differences between existing chemicals of concern lists and transparency labels, of which there previously was no central public repository of comparisons for. It also lays out which harmful chemicals show up in which kinds of common products. This is especially helpful for smaller budgets, allowing teams to prioritize with greater impact. While the main content in the protocol is all incredibly insightful, our team found the appendices were the most valuable. Included are sample goal-setting worksheets, tracking worksheets, and healthy materials action plans. These resources can help transform the market more quickly if utilized as strategic implementation tools by project teams, regardless of project size or scope. The protocol gives a detailed overview of custom healthy materials programs by Google, Perkins+Will, SFO, and Kaiser. These are especially useful because they show how different organizations set different priorities and tracking methods, assigned responsibilities, and went about implementation. One of the major challenges in the healthy materials realm is the confidentiality restrictions that many of the organizations leading healthy materials efforts have, which slow the pace of market transformation, so unveiling a few key case studies in this report is pivotal for helping others adopt similar practices. p.28 lists considerations for prioritization, then makes it digestible by suggesting a weighted system, workflow, or flagging of certain product types so that project teams can set clear priorities and know when to compromise. Not many professionals in the industry are experts in this field yet, but this methodology helps any team navigate the often-overwhelming materials world and is a reminder that doing something is better than doing nothing. p.29 outlines a number of different performance tracking methods, along with criteria to help you select the best fit for your project. p.30 lays out how to approach defining how to measure the success of your healthy materials program. To assist, a matrix on p.46 maps the overlap between red lists, transparency labels, and key high-performance buildings rating system standards. This can be used to help teams decide if they want to focus on specific materials, follow a red list, require transparency labels, follow LEED or other certification systems, or create more customized guidelines for their program. Materials experts aren’t necessarily experts in the design and construction process. p.31 shows different players in the design and construction world how they’re all related and how to create a communication protocol to succeed. The protocol is especially directly beneficial to owners, facilities managers, design teams, contractors, and consultants because it shows when key implementation steps need to occur for success, and who needs to be involved during those stages. Similar to roles and responsibilities, p.33 outlines a review and documentation process for healthy materials standards, providing options to readers that can be customized for their projects. It shows how to QA/QC through design and construction to ensure you’ve met your goals. We encourage all design teams to review the protocol. Download it here, and reach out to our materials experts to discuss further.